Not happy: MP Greg Warren and St Peters Anglican primary school principal Brendan Gorman. MP Greg Warren has slammed the go ahead for a controversial high rise development in the heart of the Campbelltown CBD – next to a primary school and a historic church. 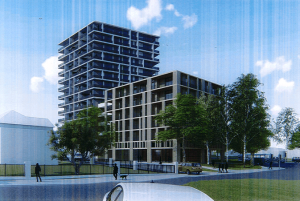 The proposed 10 storey development at Cordeaux Street had been widely opposed by members of the community, including Campbelltown Council and the neighbouring St Peters Anglican church and primary school. The site was sold to the NSW Government in the late 1970s, which in turn sold it to a developer in 2015 for more than $4 million. Mr Warren says the school and church had made several unsuccessful attempts to purchase the land back. Privacy for students and staff, gross over-development of the site and impacts on nearby historical and heritage items were all identified as areas of concern. A Land and Environment Court ruling last week paved the way for the development to go ahead. Mr Warren said he had previously urged planning minister Anthony Roberts to step in and quash the proposal, but his requests were ignored. 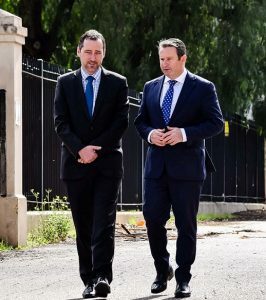 The local MP argues that since the state government was the previous owner of the site it had a duty of care to ensure any future development on the site was appropriate and in the community’s best interests. “Former Liberal NSW Premier Barry O’Farrell promised to give councils greater planning powers – however, he did the opposite and over-developments like this are the unfortunate result,’’ Mr Warren said this week in the wake of the court decision. An artist’s impression of the Cordeaux Street development, as part of the development application. “The community overwhelming opposed this development yet those concerns were ignored. “I urged the Minister for Planning to do the right thing and intervene for the greater good of the Campbelltown community. “However, those requests – like the community’s overwhelming opposition – were dismissed. “The students and staff are practically going to share a wall with the monstrosity of development. “As the previous owner of the site, the state government had a duty of care to the people of Campbelltown to ensure any future development was appropriate and in the community’s best interests – that has clearly not occurred.